SPECTREOUTREACH.com: I WON THINGY FROM ANIMAX-ASIA! I WON THINGY FROM ANIMAX-ASIA! Okay. I am not abandoning my bl;og for the record just I am quite tied-up lately with something lately.Let me update something exciting for you guys to know ^^ ! I got a e-mail from Animax-Asia that I won the Simple autographed Merchandise. Super~Cool! What Do guys thinks? (Note: I 'm be told that I am going to receive the Prize within 10 working day hopefully before Chinese New Year). Thank you for participating in Simple Plan On-line Contest. 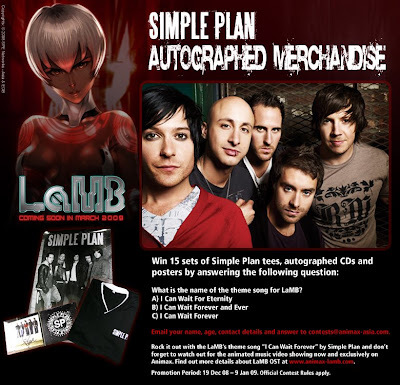 We're pleased to inform you that you have won Simple Plan Autographed Merchandise on Animax Asia website! To receive your prize, please furnish us with the following information by 19 JANUARY 2009, otherwise an alternate winner will be selected to win in your place. Hope to hear from you soon. Should you have any questions or doubts, please give me a call at (65) 6622 8722.
a Sony Pictures Entertainment company"